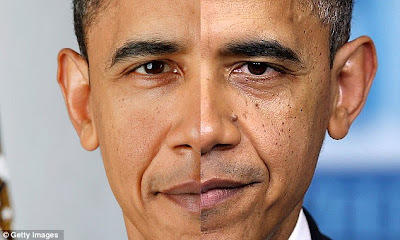 The 44th President of the United States of America, Barack Obama is a man of symbolism. Perhaps no other number is more synchromystical in his life that "4." 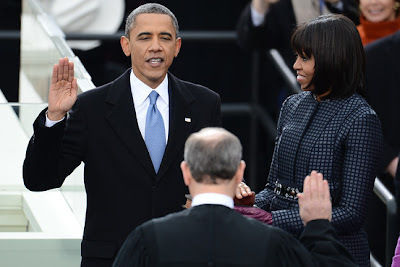 President Obama takes his 4th oath of office for the President of the USA, on January 21, 2013, the symbolically significant Martin Luther King Day. Obama was born on August 4, 1961. He married Michelle Robinson on October 3, 1992. The couple's first daughter, Malia Ann, was born on July 4, 1998; followed by a second daughter, Natasha ("Sasha"), on June 10, 2001. Obama taught constitutional law at the University of Chicago and was a civil rights attorney until 2004. He served as a representative in the Illinois Senate until November 4, 2004. 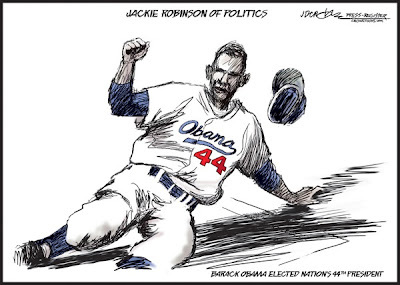 In 2004, Obama was elected to the United States Senate for Illinois. On November 4, 2008, Obama won the presidency with 365 electoral votes to 173 received by John McCain. Barack Obama is sworn in on January 20, 2009, for his first term. The first time. On June 4, 2009, Obama delivered a speech at Cairo University in Egypt calling for "A New Beginning" in relations between the Islamic world and the United States and promoting Middle East peace. On the 4th of April (the fourth month), 2011, Obama announced his re-election campaign for 2012 in a video titled "It Begins with Us" that he posted on his website and filed election papers with the Federal Election Commission. 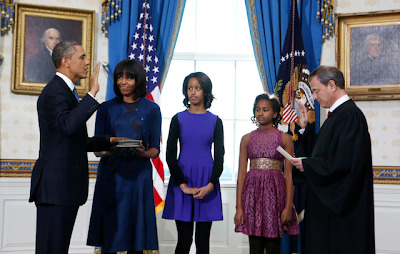 President Barack Obama is officially sworn-in by Chief Justice John Roberts in the Blue Room of the White House during the 57th Presidential Inauguration in Washington, Sunday, January 20, 2013. 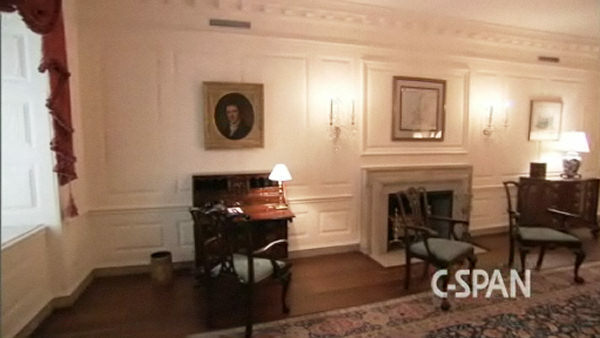 A portrait of Thomas Jefferson by Rembrandt Peale is behind the President. At noon today, January 21, 2013, President Barack Obama will have taken the oath of office for the presidency four times for his two terms. 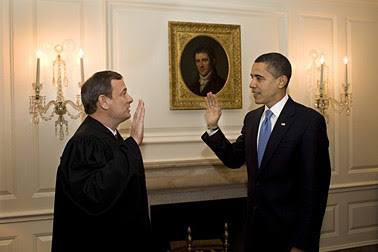 It is to be recalled that on January 21, 2009, the day after the inauguration of Barack Obama, Chief Justice John Roberts re-administered the constitutional oath of office to Obama in the Map Room (the oath having been flubbed in the ceremony the previous day). 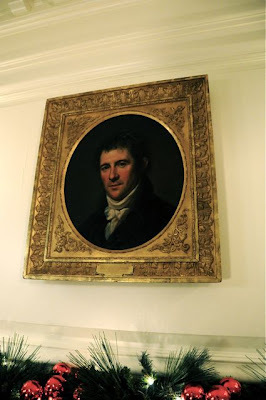 The Charles Willson Peale painting of Benjamin Latrobe, a Freemason and the first Architect of the USA, was moved from elsewhere in the White House's Map Room, to be behind the swearing in on January 21, 2009. Latrobe designed many buildings around Lafayette Park, including the highly symbolic Stephen Decatur House. The Map Room in 2008, before the second swearing in during 2009. The Latrobe painting was not over the fireplace. 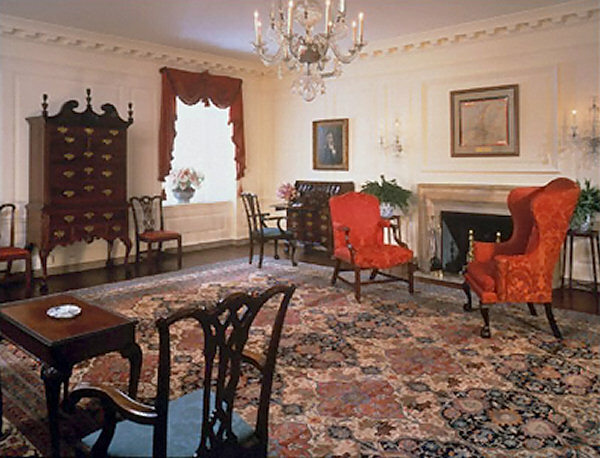 The Map Room (above and below) in 1992. 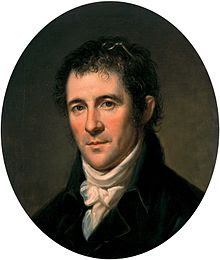 Intriguing footnote: In 1848, newly appointed president Thomas Swann and Chief Engineer Benjamin Latrobe sent surveyors to chart a route through the then-Virginia mountains west of Cumberland. Mason County, West Virginia and Point Pleasant, West Virginia - Mothman Country - were first surveyed and charted by Latrobe's surveyors. 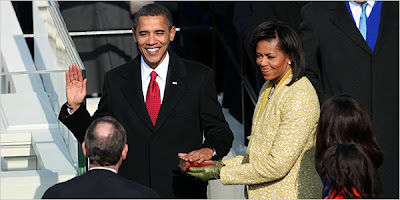 On January 20, 2013, @anomalistnews floated a news bulletin throughout Twitterland that President Barack Obama had taken his first oath this year on a copy of The Mothman Prophecies. An inappropriate silly joke, perhaps, but one in which there is a strange link to the factual "redo swearing in" of January 21, 2009. The number of order in the universe is 4—the four elements of earth, air, fire, and water; the four seasons; the four points of the compass; the four phases of the Moon (new, half-moon waxing, full, half-moon waning). The Four Noble Truths epitomize Buddhism. To the Pythagoreans 4 was the source of the tetractys 1 + 2 + 3 + 4 = 10, the most perfect number. In medieval times there were thought to be four humors (phlegm, blood, choler, and black bile—hence the adjectives phlegmatic, sanguine, choleric, and melancholic), and the body was bled at various places to bring these humors into balance. But then again so is five"
Let's HOPE it passes and clear skies prevail. 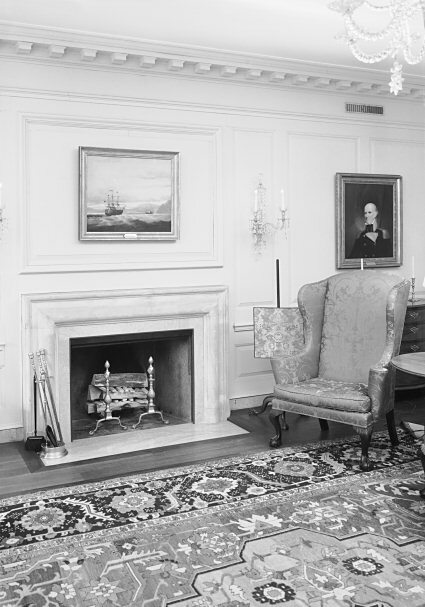 I wrote a post about the syncs around Mark Twain's final novel: No. 44, The Mysterious Stranger, and Obama a while back. That's from American Cinematographer, where SKYFALL's cinematographer describes shooting the film. The jellyfish were just footage someone found for a test, but they looked good, so they got to stay in the film.
" The jellyfish were just footage someone found for a test, but they looked good, so they got to stay in the film." That's synchromysticism for you,it doesn't have to be intentional. When I look at the Shanghai skyline in the movie,I can only see one building that could have a screen that big,and that's the Aurora building oddly enough. Medusa was originally a ravishingly beautiful maiden, "the jealous aspiration of many suitors," but when she was caught being raped by the "Lord of the Sea" Poseidon in Athena's temple, the enraged Athena transformed Medusa's beautiful hair to serpents and made her face so terrible to behold that the mere sight of it would turn onlookers to stone. If you have seen the movie "Skyfall"
I think you will see that the jellyfish seem to fit the picture better than a mere accidental clip would.But who knows? Thank you Mark and Michael for keeping your comments on topic about 44 and Obama. The four I noted as the play the Prince and the Princess attended on the day of Apophis. The Cirque de Soliel play was KOOZA ... which is the metathesis of IHVH, see Sepher Sephiroth entry 39. 39 is the three waters or 3 x 13 or the three Supernals, ie KTR/CHKMH/BNH. The cast characters map out to the lower 7 sepher, Obama as Obama/Lincoln is "daat", the Prince and Princess are CHKMH and BNH .. the Crown itself is KTR .. and is in her belly. The wrestling over iron (ie guns) in this exact timeframe is hinting that the Great Magnetic Lord is here. The Great Magnetic Lord is the only one who is fit/worthy/Qain to hold the sword in the stone. All imposter sovereigns will be de-ironed and impoversihed. As shared here before and in Ustream piece .. Obama is the Mass of the Phoenix in the Book of Lies and is the forerunner, ie the Baptizer in fire, for the Great External King. Your latest piece 'Pope Shoot Three" is rife with the three Supernals or the Great Father/Mothers. The mention of Cebu as animal fat is directly related to "BAPHOMETIS" which is immersion in wisdom. The sign of which is to pour oil (distillation of plant or animal) onto the head of the King. The oil is sign that all that went before is made into one thing, post mortem of course, and functions as fuel for the torch on the head of the Goat .. jumping to its supreme height. Beyonce's favorite number is 4. I did some number linking of my own based on your work..
Sasha birtdate: 6/10/01 [6+1+1= 8], 44 again. Born on 10th day, ten represents the "tetractys". "The Tetractys [also known as the decad] is an equilateral triangle formed from the sequence of the first ten numbers aligned in four rows. It is both a mathematical idea and a metaphysical symbol that embraces within itself—in seedlike form—the principles of the natural world, the harmony of the cosmos, the ascent to the divine, and the mysteries of the divine realm. So revered was this ancient symbol that it inspired ancient philosophers to swear by the name of the one who brought this gift to humanity". Malia and Sasha were born exactly 2 yrs, 11 months, 7 days apart. [2=11], meaning 11 11 7 (year,month,day). Obama won 365 electoral to McCains 173! Recurring numbers are 4, 8, 10, 11 (10 being reduced to (1), while (11) is essentially a double of 1.